Four days ago it was National Pancake Day. I didn't know pancakes even had an entire day dedicated to them until I saw pancakes popping up all over the blogosphere. 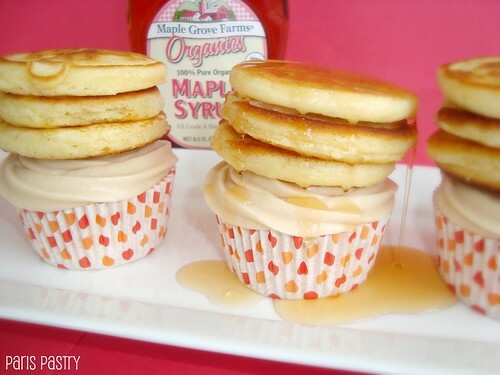 And that's where I spotted pancake cupcakes on Butter Hearts Sugar, a sweet blog which features amazing treats. There's nothing more appealing to me than a stack of golden, buttermilk pancakes. On top of a cupcake? Yes, sir! With maple syrup drizzled all over? Don't mind if I do! They're insanely delicious. You might think it's too much, but really, why wouldn't they make sense? Rating: 5 out of 5. Maple Pancake Cupcakes: cake recipe adapted from "The Complete Magnolia Bakery Cookbook"
- Preheat oven to 350 degrees. Line two 12-cup muffin tins with cupcake papers. - In a small bowl, combine the flours. Set aside. - In a large bowl, on the medium speed of an electric mixer, cream the butter until smooth. Add the sugar gradually and beat until fluffy, about 3 minutes. Add the eggs, one at a time, beating well after each addition. Add the dry ingredients in three parts, alternating with the milk and maple extract. With each addition, beat until the ingredients are incorporated but do not overbeat. - Using a rubber spatula, scrape down the batter in the bowl to make sure the ingredients are well blended. Carefully spoon the batter into the cupcake liners, filling them about three-quarters full. Bake for 20–25 minutes, or until a cake tester inserted in the center of the cupcake comes out clean. - Cool the cupcakes in the tins for 15 minutes. Remove from the tins and cool completely on a wire rack before icing. To make mini pancakes: Use a pancake mix and follow the instructions on the package. 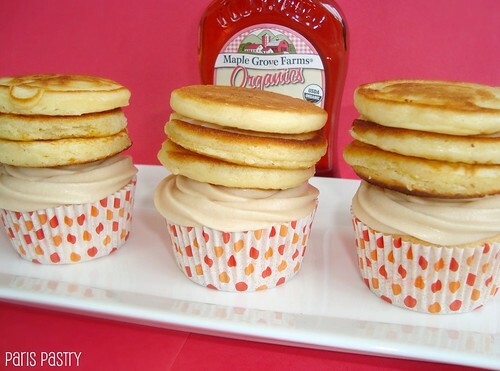 Try to make the pancakes the same size as the cupcakes. If your mini pancake is too big or not circular, you can use a biscuit cutter to trim the sides. Let them cool to room temperature before using. 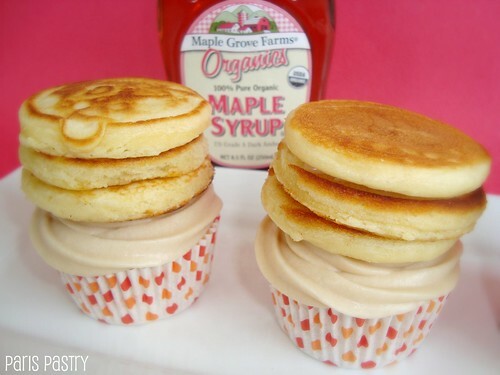 To make pancake stacks: Pick out 3 even-sized mini pancakes and glue them together using your maple frosting (see recipe below). - Combine the confectioners' sugar, unsalted butter and maple syrup together in a mixing bowl. Beat all the ingredients with an electric mixer until smooth. This is such a cute idea! I like me some pancakes and a cupcake! Not sure if the frosting would work for the combination, but if you say it's good, then it must be delicious! OMG, I don't even know where to begin. These look amazing!!! Oh my word. That's definitely enough to put on 10 pounds. Thanks for the link! Yours look fantastic, I'll have to give the cupcake recipe a try. Isn't it a fantastic pairing, I just think of the frosting as a more decadent version of the usual pancake toppings. Instead of a dusting of powdered sugar, a pat of butter and a drizzle of maple syrup its all in there in a swirl of frosting yummyness. I make pancakes for my Hubby almost every Saturday morning. I think I'll surprise him now with a pancake cupcake! Genius! Say it three times very fast! It sounds and looks amazing. But however do you eat one?! What a combo!! :D they look really good! !